Observation - waxwings - UK and Ireland. 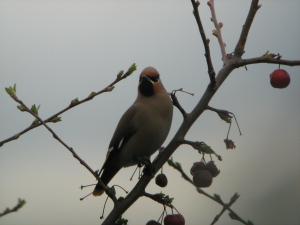 Description: 5 waxwings feeding in crab apple tree. ( the same tree held 72 waxwings about 15 years ago) Their tinkling flight calls attract attention. 5 waxwings feeding in crab apple tree. ( the same tree held 72 waxwings about 15 years ago) Their tinkling flight calls attract attention.